We’re proud to present you the project we’ve been working on for last 3 months - Baikal UI Kit. Huge and stylish set of web UI components, which main purpose is to help you save your time by facilitating designing or prototyping processes. Don't forget to push "Recommend" button, if you like our product! PIXEL PERFECT: High quality components made exactly by grid, fitting together perfectly. VECTOR SHAPES: All elements, icons and masks are made using Shape Layers. Resize any object for Retina resolution. GOOGLE FONTS: All fonts used in Baikal UI Kit are free and easy to find via Google Fonts. EASY TO FIND: Every component is properly named and organized in smart layer structure with groups and subgroups. DARK AND BRIGHT: All the elements look great in both light and dark backgrounds. 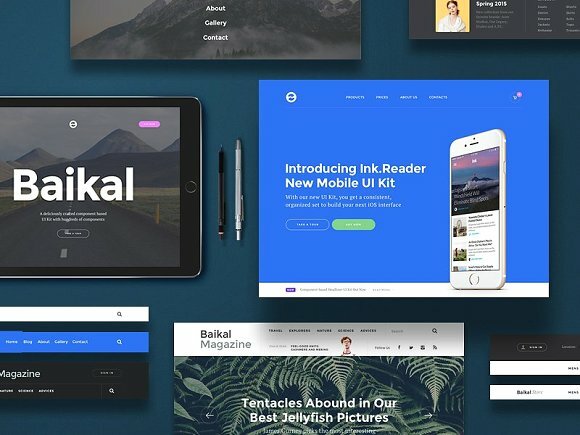 SAMPLES INCLUDED: In addition to the set you will find 2 examples of web pages, made of Baikal UI Kit elements.